This latest-generation USB 56k data fax modem expands your computer with 2 features, dial-up Internet access and send/receive fax support through USB hookup. With high speed transfer rates up to 56 Kbps for internet and 14.4 Kbps for fax function, this modem is a great dail-up adapter and fax adapter to provide backup Internet connection through telephone line or in rural areas where broadband connections are not available. The installation of this usb modem is quick and fast as it is a truly plug and play device. No manufacturer driver disc needed at all. 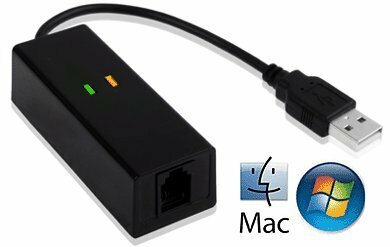 The 56K USB external data fax modem supports both Windows and Mac systems including Win10, Win8.1/8 (32/64bit), Win7 (32/64), Vista, XP, Mac OS 10.X or all later versions. With this usb fax adapter plugged into the USB port of the computer, your computer can communicate with a fax machine over a standard phone line. You can send or receive fax with ease from the USB port of the computer with no bulky fax machine needed on desk. PC users can simply use the built-in Windows Fax and Scan function from Windows system to send fax and receive fax with no fax software needed. For Mac OS X systems, users may use the standard features in OS X for sending/receiving faxes as an option. Many free fax software applications are also available on the web. Low-cost USB external solution to add dial-up Internet access and fax function to your computer through USB hookup. Easy plug-and-play installation for Windows, Mac and Linux users. No driver CD disc needed at all. Hardware-based USB modem, which saves the computer system resources and minimizes the work load on the CPU. Fast data transfer rates up to 56Kbps (download) and 33.6Kbps (upload). Send and receive faxes through your computer while running other applications. Fax transfer rates at 14.4Kbps. Powered directly from the host USB port with no external power supply. Telephone Answering Machine (TAM) support. Compact and portable design makes this USB fax modem easy and convenient for home, office or traveling. Supports all major internet service providers' services including Netzero, EarthLink, Juno, PeoplePC, AT&T, etc. If you have any questions about this product by AllAboutAdapters, contact us by completing and submitting the form below. If you are looking for a specif part number, please include it with your message.